The latest article from Canadian Business Executive Magazine. For more than two decades, Canuel Caterers has been serving a range of private, corporate and institutional clients with high quality food service throughout British Columbia. Brothers Brian and Glenn Canuel established the business and worked over the course of 23 years to expand across various markets. From a single location in Delta, British Columbia, this distinct food service business has restructured in recent years to focus on clientele that drive positive growth. 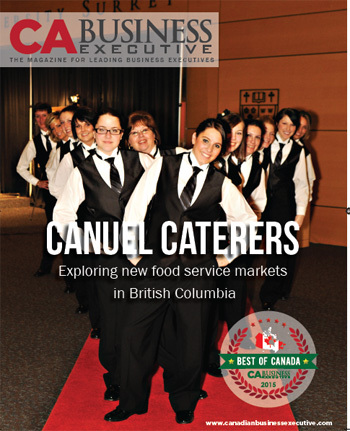 Click here for an article featuring Canuel Caterers in Canadian Business Executive Magazine. Lunch was fantastic! The food was delicious and well received, and we have a hard crew to please. Please pass along to your catering team a big thank you! They were all so friendly, helpful and it all went so smooth. We truly appreciate all the hard work at this busy time a year. We will be in touch again. I have had a few people ask for your contact info for our catering events in the future. Click here to read more testimoials. Copyright © 2019 Canuel Caterers. All rights reserved.